Bioinformatics is viewed here as an interdisciplinary field that greatly benefits from collaborators coming from disparate backgrounds. This short course will use a problem-solving, collaborative approach to analyze molecular data in several different ways. Bioinformatics is being applied to solve current biological problems in areas such as medicine, agriculture, conservation, and evolution. The relationships between evolutionary theory and the analysis of molecular sequence and structure data will be emphasized. The course’s focus will be on learning about the causal bases for bioinformatics analyses along with a philosophy of education: problem posing, problem-solving, and peer review/publication (BioQUEST’s 3 P’s). Theoretical, mathematical and computational aspects that underlie bioinformatics. The discussions focus on how to analyze data, how to implement bioinformatics investigations across the curriculum, and how to develop sustained collaboration. Each full participant will receive a copy of our book Microbes count! : Problem Posing, Problem Solving, and Persuading Peers in Microbiology which has seven bioinformatics labs that we will use in the workshop. 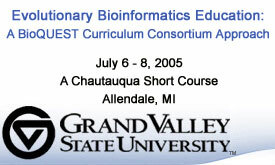 Biology who are interested in implementing bioinformatics across their biology curriculum by incorporating bioinformatics into a variety of courses, as well as mathematicians and computer scientists who are interested in teaching bioinformatics or computational molecular biology and interacting with biologists. 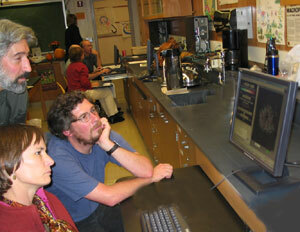 An interest in teaching biology or mathematics or computer science using bioinformatics. Professors John R. Jungck and Sam Donovan have offered numerous workshops in bioinformatics for faculty across the U.S. and abroad and provide a web site wherein they share a variety of curricular materials developed in collaboration with professors across the nation. They are Editor and Co-Editor of The BioQUEST Library. Professor Jungck has worked in mathematical-molecular evolution for forty years and is the Mead Chair of the Sciences at Beloit College, a Fellow of the American Association for the Advancement of Science, and Chair of the Education Section of the Society for Mathematical Biology. Professor Donovan is an Assistant Professor of Science Education at the University of Pittsburgh, Director of BioQUEST’s bioinformatics education dissemination initiative, and Chair of the Education Section of the Society for the Study of Evolution.